With one of the classic films of all time. not only because of it's accolades but also the real life hatred that comes out between the two stars, Bette Davis and Joan Crawford. There isn't, as yet, a trailer for the re-release but here is the original trailer. As a child, Jane Hudson (Bette Davis) was a pampered vaudeville star known to the world as Baby Jane while her younger sister, Blanche (Joan Crawford), led life in her considerable shadow. Decades pass and Blanche becomes a beautiful, talented movie idol and Jane a has-been. When a car accident cripples Blanche, binding her to a wheelchair, Jane sees her opportunity to regain power and assumes the role of carer. Her newly gained dominance completes the transformation of the sugar-sweet child star into a nightmarish caricature of Baby Jane. As she does everything she can to make her sister's life a living hell, Jane plots a comeback, aided by shifty musical director Edwin Flagg (Victor Buono). What Ever Happened To Baby Jane? has been newly restored by Warner Bros. Pictures. Screening as part of the London Film Festival on 18th and 21st October. The film will then open in the UK on 14th December at the Curzon Soho and selected theatres nationwide. 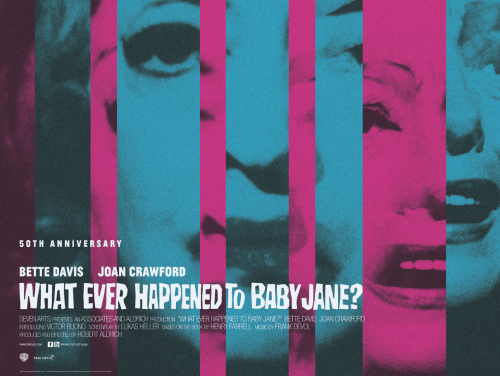 labels: film, poster, trailer, What Ever Happened To Baby Jane?